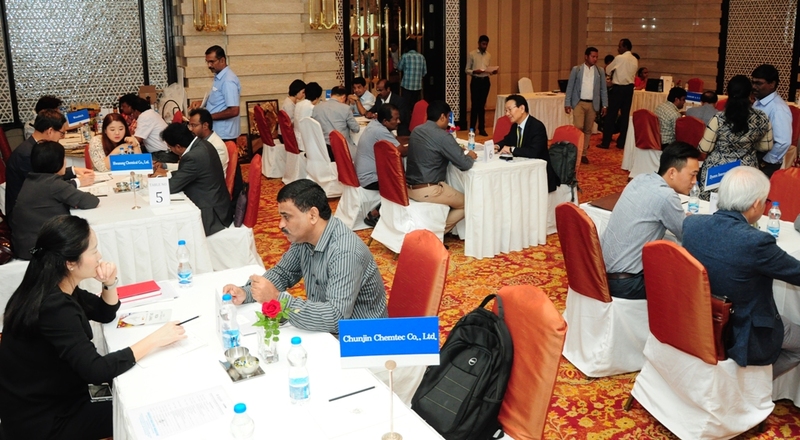 FIEO hosted a high profile Importers Delegation from Korea at Chennai today. The Delegation Members comprise multi product importers including Rubber, Adhesives, pigment, dyes Cotton yarn, Natural colour, manmade fiber lighting products, food additives, chemicals, minerals etc. While welcoming the participants Dr. A. Sakthivel, Regional Chairman, FIEO Southern Region said that presently export from India is stagnant since more than 5 years and product profile is also narrow by 50% of value of export from India is of mineral fuels / oil distillates (mainly naphtha). There is huge opportunity to export wide range of products from India including pharmaceuticals, chemicals, rubber products, textiles, leather etc. He urged exporters to focus growing Korean market. Dr. A Sakthivel, Regional Chairman, FIEO Southern Region addressing the participants. Mr. M. Rafeeque Ahmed, Vice President, FIEO while addressing the participants products mentioning that as Korea is a developed market and exporters need to send technically precise and they are conscious on quality as well as timely delivery commitments. Mr Mangat Ram Sharma, IAS, Principal Secretary, MSME, Govt. of Tamilnadu in his address said that event though India has signed Comprehensive Economic Partnership Agreement with Korea, due to various reasons our exports as well as investment from Korea not increased. He urged the Korean business community to invest in Tamil Nadu which is having huge potential on infrastructure and manufacturing. Mr. Hyung Tae Kim, Consul General of Consulate General of the Republic of Korea in Chennai while addressing the participants said that, Korea is looking forward for continuous closer relationship with India not only on trade but also other areas including defence, culture, tourism etc. Mr. Myoung-Jin Shin, Chairman, Korea Importers Association, Seoul, Korea in his address said that there is huge opportunity for Indian exporters especially MSMEs to sell their products in Korea. Since Korea lacks natural resources, the import of raw materials and semi-finished goods is essential to the country’s industrial development and economic growth. Korea import market is rapidly growing with 450 billion US$ during the year 2016 with double digit growth. Korea is having FTA with 53 countries including India, US, China, EU, Australia etc. and very active in RCEP negotiations. He urged Indian exporters to utilize low import tariff offered by Korea (1.5%) without imposing any NTBs. According to the feed back received on the B2B meetings held with Indian exporters and Korean Importers it is expected to fetch business worth of Rs.100 crores. The top 10 products imported by Korea includes mineral products, plastic and rubber products, leather, textile and garments, machinery, iron and steel, marine products, electric and electronic products etc. and there is immense scope to increase the product profile based on India’s manufacturing capacity.